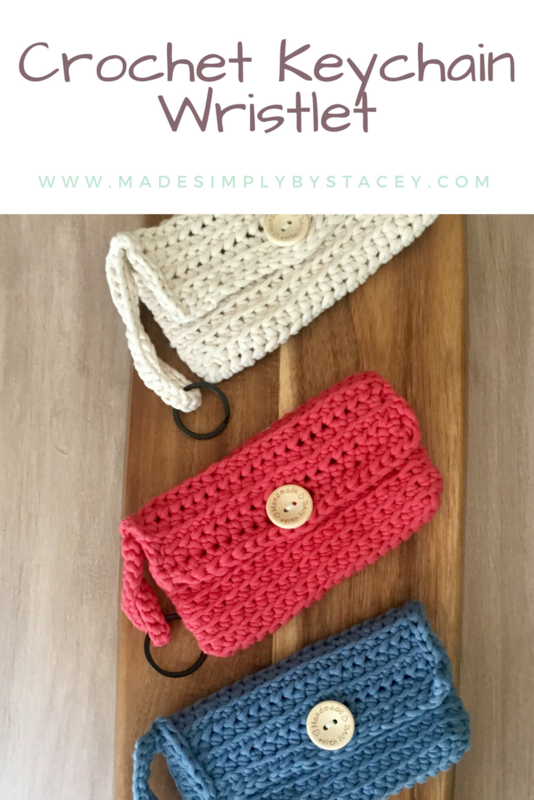 I thought this easy crochet keychain wristlet went really well with the crochet beach bag (check out that free pattern). This wristlet is big enough to hold your cell phone and some cash. It has a handy keychain that can be attached to the beach bag and/or keys. Chain (ch) – insert hook, yarn over (yo), pull through. Yarn; I used Bernat Maker Home Dec Yarn (5 bulky chunky. I linked all of these materials to Amazon, it is always nice to keep these on hand. Make a slipknot then chain 21. Hdc in the 1st chain from the hook and in each chain across, then make 19 chain stitches. (not counting chain on hook and slipknot) in the last chain add two hdc (increase). Continuing around hdc 20 adding 2 hdc in the last chain, sl st.
**Hdc under the back loops (2&3) to create the ribbed look until we get to the flap. Hdc in the next stitch until end of the round, you will end with 43 stitches without joining continue for 8 more rounds. Place a stitch marker in the first stitch of your round to track your rounds. Chain 1 turn your work. Now you are working in the back (wrong side) of your work so your stitches will need to go under the front loops. Hdc in the next chain from the hook and in the next 20 front loop stitches across. Chain 1 and turn Hdc in the next chain from the hook and in the next 20 back loop stitches across. Repeat alternating front loops and back loops for Rows. Half double crochet in 9 stitches, chain three, skip the next three stitches, hdc in the next 9 stitches. Chain 1, turn. Half double crochet across 9 stitches, hdc three stitches in the chain, crochet 9 more stitches. Turn, slip stitch around the top and down the side until you reach the corner where the flap meets the opening of the wristlet. Chain 30, Insert through the corner of the wristlet and join at the slipknot. slip stitch around. Finish slip stitch around the rest of the wristlet. Coming soon Easy Nesting Basket Pattern.